This is a sponsored post written by me on behalf of Atkins. The opinions, text and story are all mine. 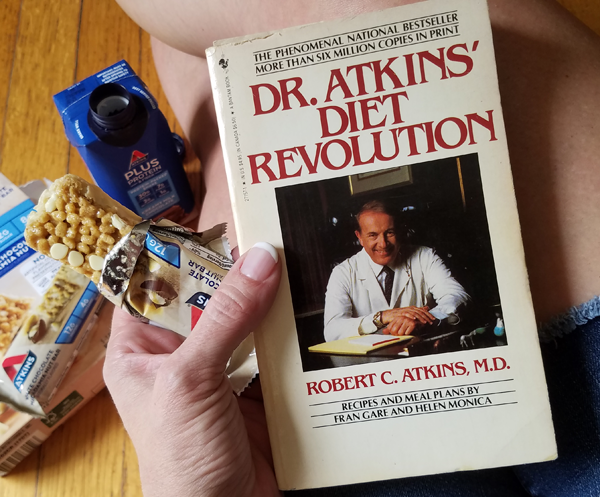 This is how my own low carb journey started: Reading the original Atkins book while eating the new Atkins bars & shakes. The first printing of this book occurred in 1972, while my mother was pregnant with me. My mother is the one that gave me this original Atkins book seven years ago, along with the advice to keep it super simple – and her low carb breadsticks recipe that has been the base for my low carb biscuits that have been SO popular with readers here. It’s my birth month. 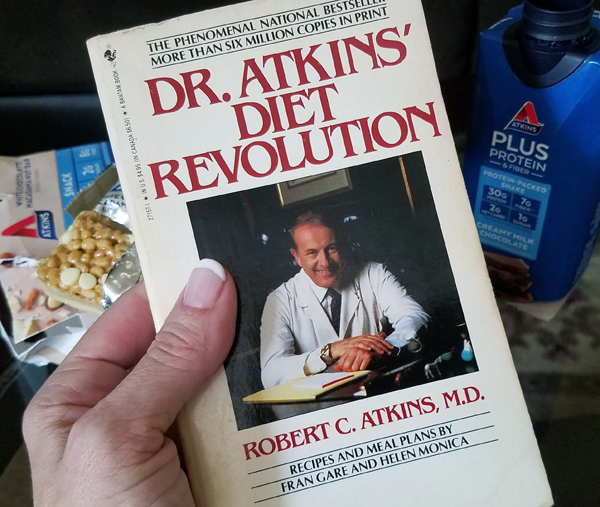 I’m turning 45 years old, so that means Dr. Atkins’ Diet Revolution (the original book) is 45 years old as well. By the time I was born in June of 1973, the 1972 edition had sold more than 900,000 copies. My mother lost her weight after having two children using the wildly popular original “Diet Revolution” book by Dr. Atkins in the early 70’s. She has continued to follow a low carb lifestyle, and passed that book and her advice on to me when I started eating low carb in 2011. Atkins has been supportive of my lifestyle change from the start, and also of our community here. In fact, it was Atkins that got our HUGE Low Carb Challenge Group off the ground (with a bang!) almost seven years ago. They were responsible for the first 1,000 members of our group that is now well over 100,000 strong. I often refer people to the Atkins website for the handy Acceptable Foods List. The Atkins20 / Phase One list is ketogenic friendly and is exactly what I used to get started on the low carb lifestyle myself. I also refer people to Atkins for their extensive “How It Works” Science Library of great articles. Every question I’ve ever been asked in more than seven years of blogging here is addressed on their website and also in this new book in detail. You should also check out their site to learn more about The Hidden Sugar Effect – foods that you think are healthy that actually turn into sugar when digested. You don’t see the sugars, but your body does – so you want to make sure you’re avoiding foods that you may think are healthy, but aren’t actually as healthy as you think. Atkins sent me a copy of their brand new “Atkins: Eat Right, Not Less” lifestyle book and I’ve really been enjoying it. Unlike the original black & white all text book, this one is bright and FUN and filled with full color recipe photos and helpful charts & illustrations. I really like the charts, meal plans, and the lifestyle sections of the book the most. From tips on eating out to a section on mindful eating, it’s a great read. It includes a lot of shorter sections chock full of tips & ideas, so I pick up something new (or a fresh dose of inspiration!) every time I open it. I’ve been having fun coming up with my own Atkins recipes lately, like the super popular Low Carb Cinnamon Crunch Coffee Cake Recipe I made. 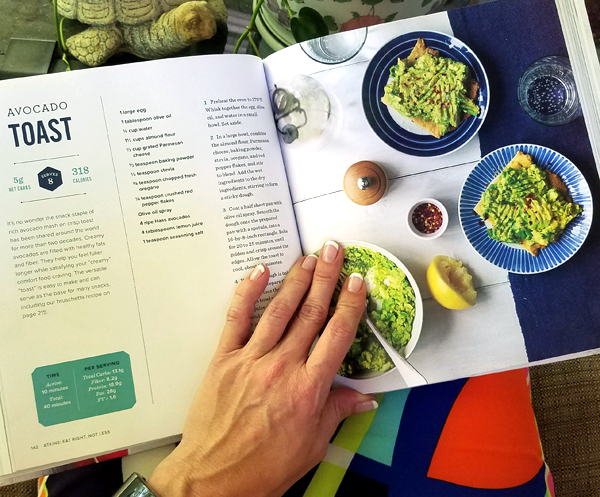 I decided to browse through the recipe section in the book for some fresh low carb breakfast & dinner ideas, because I’ve been feeling “food bored” lately – which is always a recipe for disaster, lol. 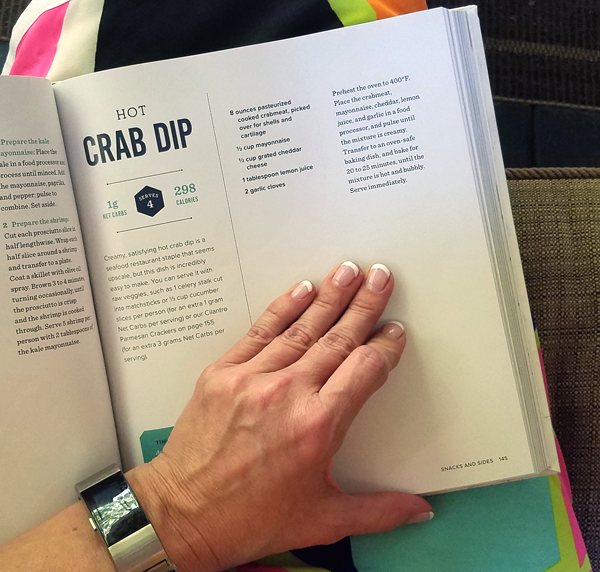 One of the first recipes in this new book that caught my attention was the Hot Crab Dip on page 145. 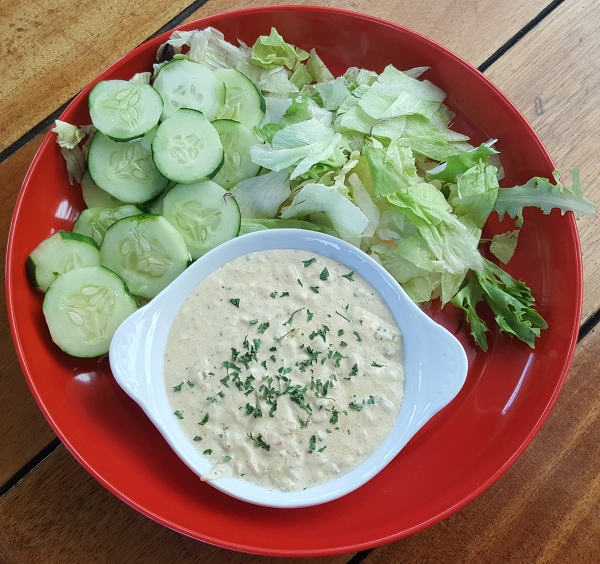 I was immediately taken back to the memory of this amazingly delicious hot crab dip I enjoyed while sitting on a huge deck overlooking the beach at Okaloosa Island. I ordered it with cucumber slices and lettuce instead of chips, and ate every single bite! I have to say, the dip was even better with crisp lettuce and cucumber slices on a hot day at the beach. I can’t wait to try this recipe from the new Atkins book at home!! 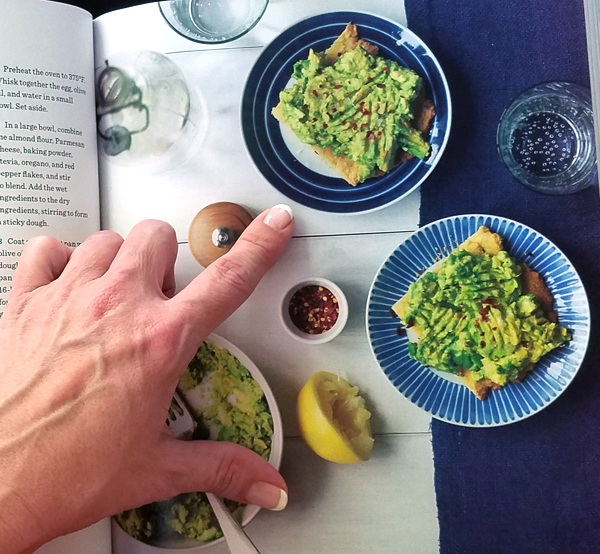 As I continued flipping through the recipes, the next one that caught my attention was for Avocado Toast on page 142. As you can see, they provide you with some creative new recipes to try. The book also has a very “fresh & breezy” feel to it, making it easy to read, with full color illustrations on most of the recipe pages. Like I said, I’ve really enjoyed the lifestyle sections and charts & information the most, but I’ve had great fun flipping through all of the recipes too. 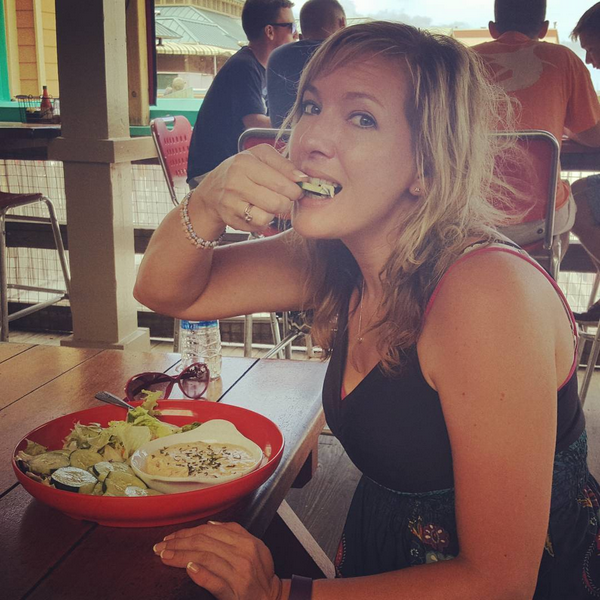 On Atkins, you eat the right foods, not less – which I love! You never have to go hungry with a low carb lifestyle. That was the one point that sold me on getting started more than seven years ago, and it has been the main reason I’ve been able to sustain it as a healthy lifestyle all this time – rather than just a temporary diet. Reading the new Atkins lifestyle book made me nostalgic and reminded me of the original book, and how this whole life-changing journey started for me. It made me think of my mother, the 45 years since she brought me into this world, and the 45 years that Dr. Atkins “diet revolution” has been making waves and changing lives in that same amount of time. 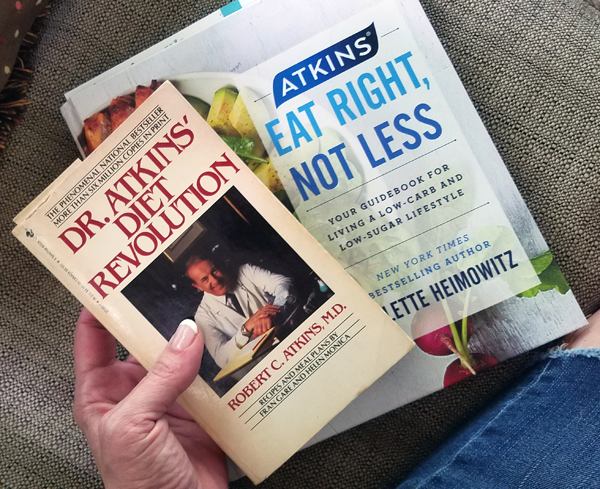 I pulled it out this week and started reading it again, alongside the new Atkins lifestyle book titled “Atkins: Eat Right, Not Less” – which is a much easier read, and so much more bright & colorful! Switching to a low-carb and low sugar lifestyle is the BEST thing I have ever done for myself. It’s hard to believe so much time has passed, and even harder to believe I found a healthy lifestyle change I could easily sustain for more than seven years now. I started out afraid I would fail, believing I had no willpower to stick to any diet or lifestyle change, and only in it to lose weight. Little did I know that it would become a way of life for me, and that it’s so EASY you don’t even NEED willpower – just a commitment to get started and see results. The results have been far greater than I expected too. Not only did I lose the weight, I’m now out of chronic pain and able to live a fun active lifestyle again. I’m no longer on treatment for back pain and inflammation, I no longer have chronic migraines, and I’m happier and healthier than I’ve been in all of my adult life. Here’s to 45 years and countless life-changing low carb success stories along the way – with many more to come! PS. 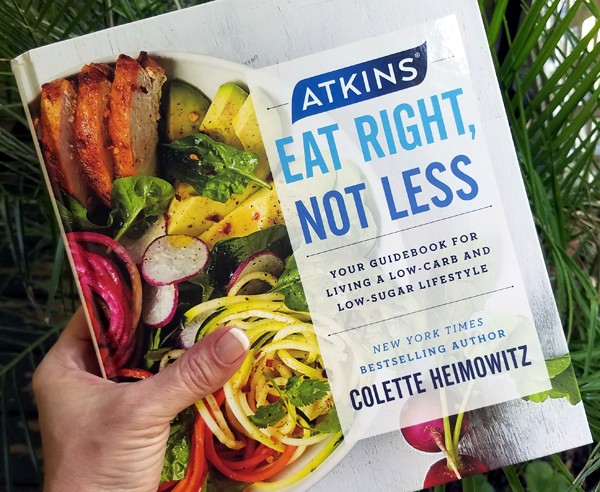 Check out the new “Atkins: Eat Right, Not Less” lifestyle book, and read up on The Hidden Sugar Effect too. I highly recommend the “How It Works” Science Library so you can better understand how a low-carb low sugar way of eating works – and read up on the health studies under specific sections that talk about diabetes, cholesterol, high blood pressure and other “hot topic” issues. My TOP resource and recommendation is still their Phase One Acceptable Foods List, which I refer everyone to as an easy way to get started – because that’s the low carb food list I started with myself. This entry was posted in Diet Book Reviews and tagged recipes, reviews. Bookmark the permalink. I regularly read your posts. The pictures help a lot!!! I have to tell you that I have lost 23 pounds since 3/17/18. I am 5’2″ so that is nice. Having good food options is key. Something you can look forward to eating. I went 12 days without losing and was getting discouraged, but I decided to eat extra yummy (on plan) foods to get me through. Then I lost two more pounds. Woo hoo. That’s great to hear, Amy! Those weeks where you don’t lose weight at all are totally normal, especially following a loss on the scales – it’s just your body adjusting. 😉 It happens to all of us as part of the very normal lose/hold/hold/lose weight loss trend. Good for you for sticking it out and staying on plan until it passed! Happy Birthday Month to you!! and thanks again!! I’m so glad, Susan – that makes my day!! A few years ago I was looking for, and found the 1972 printing at a Salvation Army Store. Someone had said that was a better book .